Relieved & excited! I’ve made it through my 1st trimester (woo hoo!) and am finally allowing myself to feel the excitement that has been bubbling just below the surface for the past couple of months. And – oh yeah – we found out…IT’S A GIRL!! Since I’m a total nervous nelly, we decided to do genetic testing and at 13 weeks we found out the gender and that our baby seems to be healthy. We also decided to share our big news with friends, family and coworkers. THANK GOODNESS…that was the hardest secret of my life to keep! Beyond all of the excitement and gender reveal, I’m feeling pretty good. My energy is beginning to come back, but the increased trips to the bathroom at night have definitely decreased my quality of sleep. I’ve also started to experience some stretching pain in my pelvis and low abdomen which has forced me to change up my fitness routine. But I honestly can’t complain too much. Not one day goes by that I take for granted being pregnant. So for now, I am totally embracing the changes (good + bad) in my body and excited for what’s to come! Well, as I mentioned, I’m having some pretty significant stretching pain in my low abdomen. I first noticed the pain around 15 weeks while running on the treadmill during a HIIT class. As I ran, it felt like I was straining or pulling all of the muscles in my low abdomen/pelvic area, but I decided to run through the “discomfort” anyway. After all, I always hear about women running well into their 3rd trimester and I really wanted to be a badass like that! Stupid mistake. You’d think I’d know better and practice what I preach to my prenatal clients: “Listen to your body! Don’t do it if it causes pain!” I was actually so sore for the next few days that it hurt to move from a sitting to standing position, to walk, and to lift my knees up to put on socks and shoes. Bottom line, running is no longer right for my body. I still take my cardio interval classes, but now I walk on the treadmill instead of running and I’ve started to modify high impact moves, such as jumping. I’m still doing Reformer Pilates, but instead of taking group classes 3 times a week, I am doing 2 classes and taking a private session with one of Reforming Indy’s pre + postnatal Pilates specialists once a week. During my private sessions, my instructor and I focus on exercises and stretches specifically tailored for the 2nd trimester and my body feels amazing after each session. When taking group Reformer classes, I modify any movements that are contraindicated during the 2nd trimester. A good Pilates instructor, trained in prenatal Pilates, will know how to keep you safe in a class, but taking a private before jumping into class is always the best way to learn your modifications. My appetite was still pretty strong throughout month 3; although, it did start to slow down around week 17. This month was another month of trying to fight sugar and carb cravings with only moderate success. 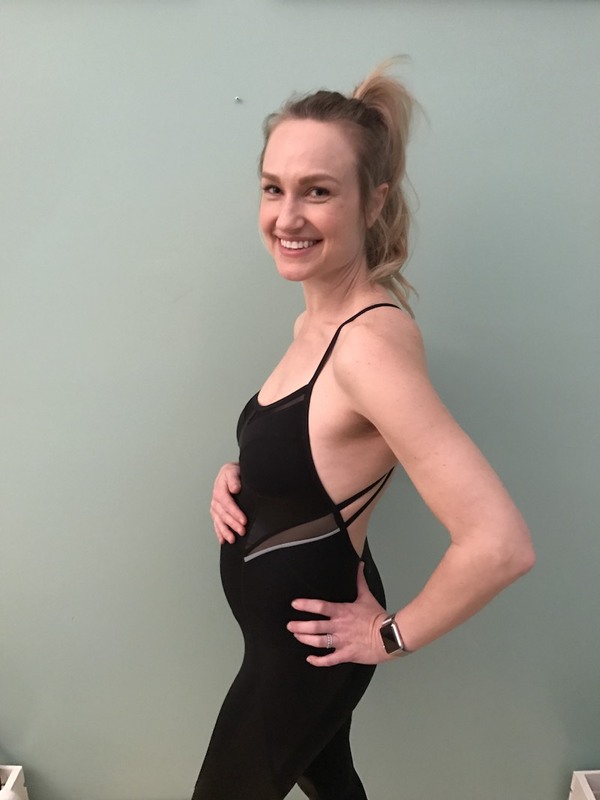 I got a bit of a wakeup call at my 16-week appointment when the scale revealed that I had gained 8 pounds in 4 weeks – oopsie! My doctor didn’t seem concerned and said that most women gain the majority of their weight at the beginning of their 2nd trimester, but I knew I had probably been indulging a bit more than necessary over the last few weeks. As far as what I’m actually eating, not much has changed since month 2. I’m still trying to pack in the nutrient dense foods and get plenty of protein and calcium. I’ve been on a huge Romaine Kale Chicken Caesar salad kick which gives me lean protein and nutrient dense leafy greens. Everything still feels pretty darn good except for the pesky round ligament/stretching pain. I definitely have more energy throughout the day! My low abdominal/pelvic area feel strained if I overdo it with too much high impact exercise.